Hockey Blog In Canada: Another Canadian Team? While the title may get people in Quebec City excited, the real news is that there is a possibility of a new Canadian AHL team! As of right now, there are three AHL teams in Canada - Winnipeg, Toronto, and St. John's - and it's a bit of a problem in that the Manitoba Moose, based in Winnipeg, only play the Toronto Marlies in the East-West crossover. The IceCaps have yet to visit Winnipeg, and the former IceCaps now playing as the Moose have never returned to Newfoundland. It seems, though, that one Canadian NHL team is slowly putting the pieces in place to have their current AHL affiliate move north to Canada! While nothing has been announced by the Ottawa Senators or the AHL, it appears that the Binghamton Senators will move north for the 2017-18 season as they take up residence in the former OHL city of Belleville, Ontario! According to Jason Miller of the Ottawa Citizen, "Broome County officials have confirmed their Binghamton Senators are heading north in 2017" as the AHL realigns itself through several moves of current AHL franchises and possibly the founding of a new one for the Las Vegas NHL franchise. Clearly, one never likes to celebrate another's misfortune, and the loss of the Binghamton franchise is one that sees the former Calder Cup champions leave the home where they reached the AHL's pinnacle in 2010-11. The Senators are currently in a great spot when it comes to building rivalries as they are within an hour's drive of Syracuse, Rochester, Albany, and Wilkes-Barre/Scranton. If the rumors are true, Belleville would remain close to Syracuse, but its greatest rival would be the Toronto Marlies. One of the issues that the AHL may have with the move to Belleville is the size of Yardman Arena, the former home of the Belleville Bulls. As it stands, Yardman Arena only seats 3257 people, and there would need to be extensive upgrades done to the 37 year-old facility. As the Senators explore their own new arena situation in downtown Ottawa, I'm not sure that owner Eugene Melnyk would be able to partially or wholly fund the building of two new arenas. Further to that, Yardman Arena has an Olympic-sized rink inside of it, so changes will absolutely need to be made if the arena was to house an AHL club. In any case, the annual summer moves in the AHL continue this summer. We've already seen the Tuscon Roadrunners pop up in Arizona desert after spending years in Springfield, Massachusetts as the Falcons. Broome County executive Debbie Preston, as per Jason Miller, has already confirmed that the Senators are all but gone, and it appears the moves may not be done if the rumors of another team holds true. Is the AHL becoming a transient league? The league likes the Binghamton area. The New York Rangers had their AHL affiliate in Binghamton prior to Ottawa's affiliaition, and there were the legendary Binghamton Whalers in town many moons ago. Miller asked Miss Preston about the AHL's commitment to Binghamton, and her response was interesting. When asked about losing the team to Belleville, but being able to maintain a similar calibre team, Preston stated, "The AHL has committed to staying in Binghamton and Broome County, and as long as the league keeps that commitment, I am satisfied," indicating she's pleased with the AHL's arrangements to replace the Senators with one of the handful of teams being shuffled around under league restructuring plans. If you're Binghamton fan, why buy jerseys in the future if teams only hang around for a decade or so? And if you're the AHL, how can you make promises to a city when you continually move teams out of that city? Look, I get that NHL teams that own their own affiliates are free to do what they want with said affiliate. 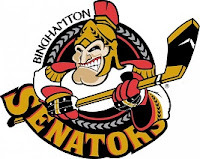 If the Ottawa Senators wanted to move the Binghamton Senators to Kanata and Scotiabank Place, that's their prerogative in getting their minor-league affiliate closer to the NHL club. But at some point along the way, you have to think that AHL President and CEO David Andrews says "enough is enough" when it comes to his league always having to bend to the wills of the NHL owners. Granted, he has his Pacific Division well-established and Tucson will help bridge the gap between California and Texas where the Texas Stars and San Antonio Rampage play. In doing so, he's left markets such as Springfield, Worcester, and Manchester. He's seen successful hockey histories an teams walk away from cities like Houston, Peoria, and Salt Lake City. And now it seems like two additional markets with deep AHL roots will be abandoned as early as next season. I'm happy that Belleville is getting a hockey team back, but losing Binghamton as an AHL location isn't ideal. If David Andrews holds true to his word and can get another team into Binghamton in the next few years, all's well that ends well. If he doesn't, he'll lose all credibility with every other AHL city in the league. Of course, if the Senators don't, in fact, move their AHL affiliate and honour their agreement through 2019 as their contract states, this entire article is nothing more than academic. The move has only been reported from the Binghamton and Broome County, not the AHL and Ottawa's sides. As we know, every story has three sides normally, and two out of three would be far more convincing over one out of three. What To Do With Russia?